Welcome. 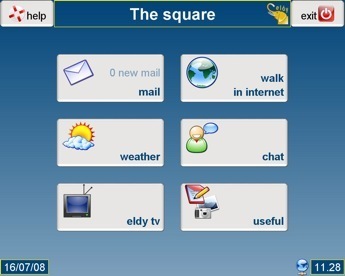 Eldy is the since 2006 the first freeware dedicated to the senior to allow elderly to access internet and computer in an easy way. Eldy was first released in 2006 and is free of charge and free from ads. Eldy has email client (pop/imap), chat, browser, rss&weather, skype interface (sorry just in the windows as for now as SKYPE API don’t work stable in Linux in Java platform). You can find all details about the ELDY project at –> www.eldy.eu. if you want to try direct install without package manager use this direct link to eldy.deb. Eldy 2.1 – tar.gz for download! you can download Eldy 2.1 tar gz for linux. I tryied it on a Damn Small Linux with 64Mb ram and it works! “Eldy package: over 150.000 older people are browsing the internet now making to the grandchildren all over the world, making to the friends , making to the business partners, thanks to the first software designed and developed specifically for seniors Citizens, and it is supplied free of charge”. This is main screen of the software Eldy. This is THE SQUARE. There are six bigs icons. On the top of screen there is mail. Here you can write, read and receive email. All these operations are easy and intuitive. Then there is walk in internet: it allows to entry in web world! In the center of screen there is weather. Here you can see weather forecast. Then there is chat: it allows to communicate with other people. In this way you aren’t alone! At the bottom there is Eldy tv. Here you can see web video. At the end, there is useful. With this you can do some exercise to gain experience with mouse. Eldy is the first software to allow over 55 to enjoy the internet and the computer. Eldy has over 150.000 users since January 2007. These users are mostly (>95%) over 55 and most of them (>70%) did not use computer before installing Eldy or having Eldy installed. If we provide senior and illiterate users a clear software, they get in love with technology. EldyBorgofranco is the localized version, dedicated to the senior to allow elderly to access internet and computer in an easy way for Borgofranco d’Ivrea, a small village in Regione Piemonte.